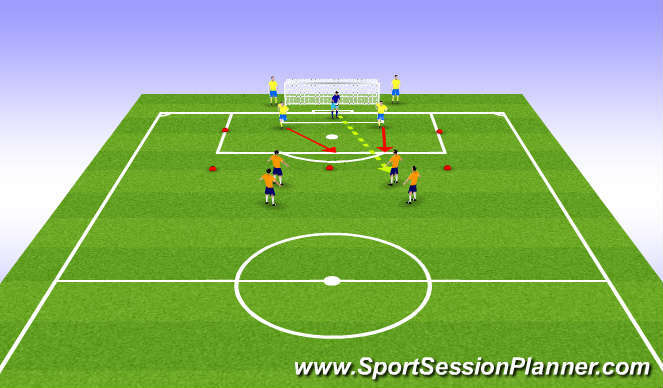 Set Up: Use as much space as possible, and have players 15 yards apart in pairs with one ball between them. 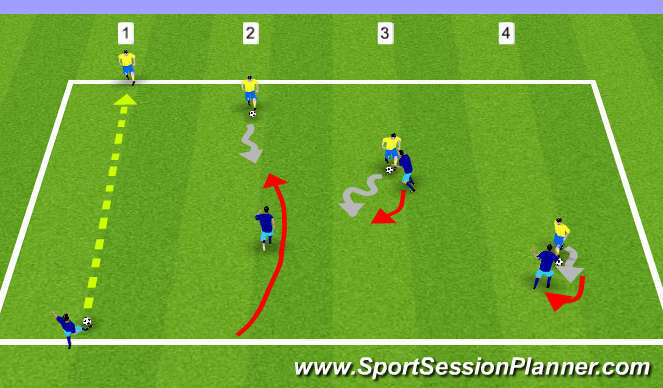 Activity: 1) Player passes ball out, and 2) sprints out in an arced run to "Close Down" attacker. 3) Defender "Slows Down" as they approach attacker so as to not outrun them, and "Shows Down" or gets into a staggered, side-on athletic stance. 4) Attacker dribbles and works on their moves going forward as defender SHADOWS them and works on pivoting as attacker moves forward and side to side. Coaching Points: "Close down, Slow down, Show down, Shut down", close down run must be arced to take away one side of field, when defender pivots to adjust to attacker&apos;s advances, they must overcompensate and move to cut off other side from attacker. Don&apos;t take the ball away! Set Up: 30 x 25yards.Two goals. Cones along centre. 3v 3 Attacker v defenders. Activity: Coach plays ball out towards attackers who try to score.Both teams enter pitch. 1st defender is the nearest to the ball - DELAY then PRESSURE. If pressure defender is beaten, then covering defender must quickly come up to pressure, and initial pressuring defender re-COVERS. If defenders win ball, they attack opposite side. Progression - 4 v 3 overload. Add two more goals to make it more difficult.